02 Oct 2018 --- Biotech company InnovaFeed, is extending its roots in the Hauts-de-France region and will base its next insect protein production unit in Nesle, as part of a new project in partnership with Tereos. 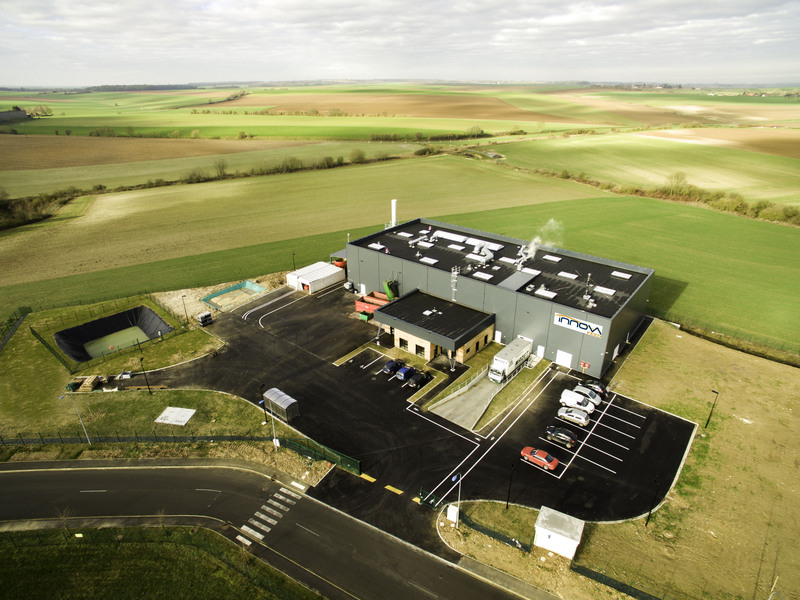 InnovaFeed, who markets a new source of proteins derived from the breeding of insects, will locate its next production plant in Nesle (department of Somme). This comes at a time when the insect protein sector is gaining traction, not only for animal feed but also for human consumption. The partnership with Tereos, which is a world first regarding its ambition and scope, will locally process the starch facility's co-products as basic feed for breeding insects, according to the company. The principal aim of this partnership in Nesle is to create industrial synergies with new environmental and economic benefits at a regional level. The partnership meets the growing requirements of the animal feed sector and is contributing to the development of a high-quality fish farming offer, at a time when worldwide protein requirements are expected to double between now and 2050. The insect protein industry, as a whole, is seeing vast growth potential. The demand for natural and specialty foods has increased dramatically in recent years and is expected to continue to rise even further in the near future. Meeting this demand may require producers to take a closer look at “alternative” ingredients. Among the various novel “natural” ingredients that are available, ingredients derived from insects in various forms are now seen as “the new kid on the block” taking their place alongside algae, seaweed and legumes. The current world population of 7.2 billion is projected to increase by 1 billion over the next 12 years and reach 9.6 billion by 2050, according to a United Nations report. In order to feed a growing population, we must consider alternative protein sources. The announcement comes as new research finds that promoting insect-based food as pleasurable, rather than healthy or environmentally-friendly, could be the most effective marketing strategy for these currently taboo or unappealing foods. Published in Frontiers in Nutrition as part of a special research collection on food systems, the study is the first to compare promotional methods for insect-based food. Promoting insects as tasty, or even as a luxurious and exotic delicacy, could help to change attitudes and achieve more sustainable food production and healthier diets, the research finds. Food production accounts for an enormous 25 percent of all human greenhouse gas emissions. Livestock is a huge contributor to these emissions and researchers and policymakers are trying to develop and promote more sustainable ways to produce animal protein, including the farming and eating of insects. “Insects have numerous health benefits as a source of protein and dramatically outperform conventional meats in terms of greenhouse gas emissions,” says Professor Sebastian Berger, of the University of Bern in Switzerland. “Therefore, insect-based food might help in the fight against climate change.” Long-term social considerations, such as environmental protection or improved health, don't appear to be enough for consumers to overcome the insect “disgust” factor. As people's aversion towards insects is largely emotional rather than rational, it makes sense to try to influence their emotions rather than make rational appeals about long-term issues. Further larger studies are needed to establish if a large-scale switch from conventional animal protein to insect-based foods is feasible. InnovaFeed has developed an insect breeding model that enables the short-loop processing of agricultural food co-products into feed for insects. These insects, i.e., flies that are endemic in Europe and do not carry disease, are not invasive, and are identified as risk-free by the European Commission, are a source of protein with a high nutritional value intended for feeding farmed fish. Worth over US$114 billion in 2017, aquafeed is predicted to grow by a factor of 2.5 in just eight years to nearly US$290 billion in 2026, according to Reuters/MRC Statistics, March 2018. InnovaFeed pilot production site in Gouzeaucourt, France. As part of the same ethical approach, the organic waste generated by the insects will be used as a natural enhancement for the local organic farming industry. This is a production system that creates significant value and does not generate any waste. InnovaFeed is not yet currently positioned on any food applications, according to Walraven. “The North of France is the region that generates the most agricultural by-products in Europe. Our insect rearing and production process use these by-products, it is, therefore, a very strategic location for InnovaFeed. We have also benefited from the support of local authorities which have been very helpful in accelerating our development,” she explains. In July last year, new novel food implementing rules have the support of insect producers. The International Platform of Insects for Food & Feed (IPIFF) welcomed the EU’s recent publication of a package of proposals setting out detailed requirements for the European Union’s “novel food” legislation. The IPIFF federation now seeks rapid adoption of these new rules. The legislation change at the European level opened up the market for aquaculture – this will be InnovaFeed’s main focus for the years to come but the company is also exploring feed applications for other farming sectors. “The demand for quality protein for fish feed is growing by 10 percent per year and estimated to achieve 125-150 MT by 2030. Opportunities for expansion across different geographies in the upcoming years are huge (Africa, Asia, the Americas). We are also exploring various applications for insect protein beyond aquaculture (feed and food) and conducting research on various properties of insect-derived products to develop these future applications,” she notes. 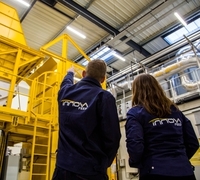 InnovaFeed, based in the Hauts-de-France region which is strategic in terms of its development, has an initial pilot production plant in Gouzeaucourt (near Cambrai) that has enabled it to check its model. Buoyed up by this success, InnovaFeed is now announcing the construction of a new facility with ten times the capacity. The opening of this new facility will result in the creation by InnovaFeed of over 110 direct jobs at the Nesle site, including positions as operators, technicians, and engineers. This installation is supported by a large number of players, including Government departments, the Hauts-de-France region, the department of Somme, and the Eastern Somme Combined District Council. The facility is scheduled to begin operating in the last quarter of 2019. The operation of this unit will specifically enable the avoidance of 25,000 tons of CO2 per year. InnovaFeed is exploring feed applications for farming sectors. InnovaFeed’s next production unit will be located right next to the Tereos starch facility in Nesle, which is on an industrial site that is currently owned by Tereos and does not involve any farmland. “The emergence of this collaboration is based on the convergence of our expertise and ambitions for the future. In the case of Tereos – a major player on the worldwide plant-based protein market, and at the initiative of the Protéines France (French Protein) Association – this facility reflects its status as a preferred partner for the development of innovative outlets that create value,” says Yves Belegaud, Chief Executive Officer Europe, for the Tereos Group. The industrial integration process set up by the two companies also aims to be a symbolic example of industrial symbiosis. In the case of InnovaFeed, this partnership secures the plant resources required to develop its business activities, thanks to a formula developed jointly with Tereos’ expertise. It enables it to gain access to the utilities that have already been installed on the industrial platform. By designing this short loop procurement and recovery system, InnovaFeed and Tereos are contributing to optimizing the use of natural resources, with a strong positive impact on climate change. Proti-Farm is one of the world’s leading producer of edible insects. Based in The Netherlands and after acquiring Kreca in 2014 they have been in the insect producing business for more than 35 years. The company started with over ten different insect species for the animal feed industry. However, since 2007, the group is producing edible insects for human consumption. Also tapping into the trend for insect protein is US-based start-up Chirps Chips. Around two billion people already eat bugs as part of their diet. As the global population continues to rise, more and more people are looking for insect protein as a sustainable food source, according to Rose Wang, Founder of Chirps Chips. Not only do many insects, including crickets, contain all nine essential amino acids, this type of protein is also sustainable, especially in comparison to traditional meat sources. It takes one gallon of water to produce one pound of insect protein. Almost two thousand gallons of water, by contrast, are poured into every pound of beef that lands on a plate. US-based start-up Chirps Chips is on a mission to educate Western society on the benefits of insect protein in a corn snack. You can read more on this here. AgriProtein is another company who is tapping into the trend for insects as feed. Earlier this year, the company raised US$105 million in funding, marking a new high in investor appetite for the insect protein sector. The raise by AgriProtein Holdings UK, together with additional local project finance for a series of factory builds in Africa, the Middle East and Asia, puts AgriProtein on track to deliver its ambitious factory roll-out plans, the company said at the time. The company is building a global business through its circular economy strategy: up-cycling organic waste to tackle the food security and waste disposal challenges posed by the world’s burgeoning population while helping conserve wild-fish stocks in our threatened oceans. 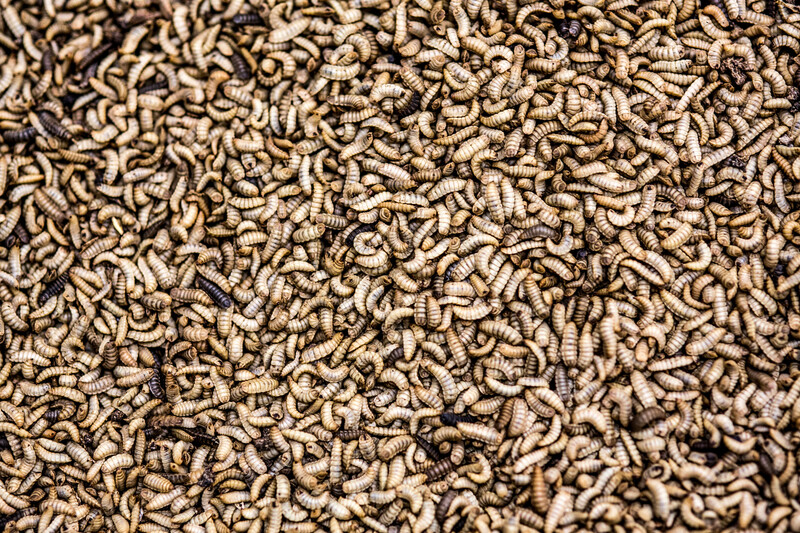 AgriProtein uses black soldier flies and their larvae to convert organic food waste into a high-protein alternative to fishmeal suitable for fish, poultry, pigs and pet food. You can read more on this here.